In the heart of Lorraine, in a rural village of 1000 residents, the Centre d’Art de Delme is located in an old oriental-style synagogue built in the late 19th century. In 2012, the centre d’art and the commune inaugurated a public commission designed by artists Berdaguer+Péjus, for the redevelopment of the area surrounding the synagogue as well as the refurbishment of an adjacent house, intended to become a space for mediation, documentation and visitor reception. 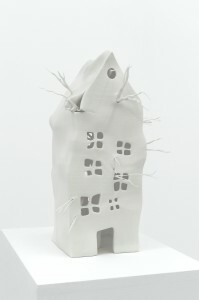 Inspired by the history of the premises, the artists decided to “make ghosts speak in public”. Radically breaking with the Synagogue de Delme’s architectural sobriety and its symmetrical layout, Berdaguer+Péjus concealed the house that needed to be renovated (successively a prison, school and a funeral home) under a quite irregular shell of polystyrene and resin: a Gue(ho)st House. The more or less bulbous white covering grafted onto the house looks like an organic growth spreading like an epidemic, threatening to swallow everything. The “alien” extends from the exterior, in the direction of the garden. 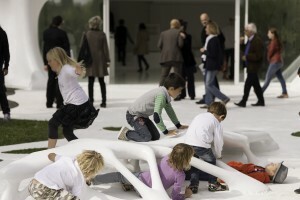 A white floor has been poured there, with holes left for plants in the bare earth, while an insect-like bench drips onto the ground. The sculpture by Berdaguer+Péjus contaminates the architecture and the landscape, while disorienting our vision like a hallucination. In their monograph published in 2012, the artists make reference to Salvador Dali’s paranoiac critical method, which they compare to a “particle accelerator 1”. According to the surrealist himself, this method consisted in producing “an object that is also, without the slightest pictorial or anatomical modification, the representation of another entirely different object 2”. Dali’s desire to “set off” the “obsessive idea” and “contribute to a total discrediting of the world of reality 3” was one of the inspirations for Jacques Lacan’s study of style and paranoia 4. At the intersection of architecture, sculpture and installation, this desire to disorient is reminiscent of André Bloc’s studies of individual dwellings or his sculptures habitacles (1963-1964), which he called “constructions with no plastic constraint 6”. Even if the artists do not claim all of this heritage, that resin graft also recalls Erwin Wurm’s Fat House (2003) as well as the deformations he inflicted on modern architecture under the title Melting. Prior to that, in 1990, Rachel Whiteread invented Ghost, a full-scale plaster negative of one room in a London house doomed to extinction. The British artist explored place-memory and architectural styles with a much more minimal form and more traditional materials. “Ectoplasmic forms” have long been shaping the work of Berdaguer+Péjus. 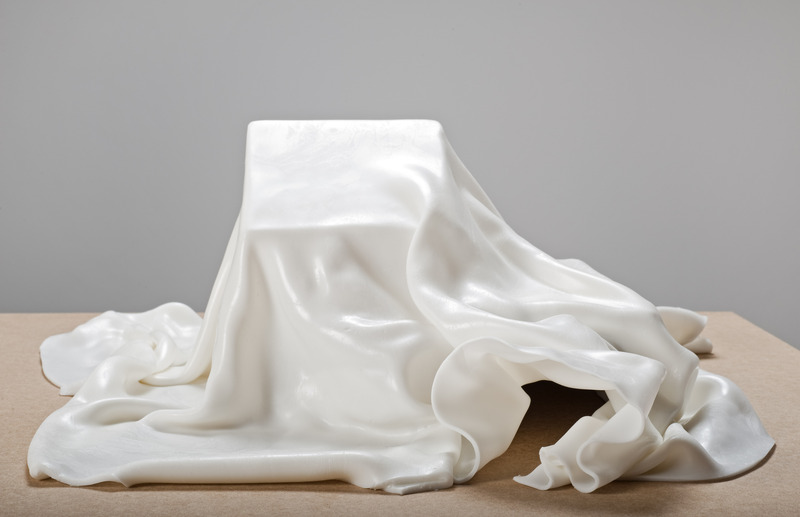 In Architecture fantôme (Ghost Architecture), for example, a wax veil covered an invisible building. In the image of the ghost archetype (covered by a sheet), the folds imply hidden forms without revealing anything. Wishing to open new dialectical territory, the artists believe that “today ghost images are the only ones that resist the intensive visual regime we’re subjected to; our retinas are saturated and it might be necessary to take different physiological, psychological, neural paths 7”… A ghostly image to greet the public? The suggestion seems perfectly in tune with our era of spiritualism, which predicts the world will end tomorrow (I am writing on 20 December 2012) and consecrates the return of romantic, symbolist and surrealist currents. The context is revealing: famous particularly for his Histoire de l’art et temps des fantômes selon Aby Warburg (History of the Art and Time of Ghosts According to Aby Warburg), Georges Didi-Huberman recently dedicated three consecutive exhibitions to Atlas ou le gai savoir abstrait (Atlas or the Abstract Gay Science)… In place the natural model of the cycles “life and death”, “grandeur and decline”, historian Aby Warburg (1866-1929) substituted a decidedly unnatural, symbolic model, a ghostly model of history in which the times no longer conformed to the transmission of academic knowledge, but expressed themselves through hauntings, relics, remanences, the “revenances” of forms. Unheimlich was the title of a 2003 exhibition at the Synagogue de Delme, where the artists presented their Anesthesic Landscape. The house is simultaneously a protective cocoon and an unsettling place that can suddenly appear strange and threatening. As we know, the uncanny, das Unheimliche, “that species of the frightening that goes back to what was once well known and had long been familiar 8”, is a concept that Sigmund Freud devised in 1919, with reference to E.T.A. Hoffmann’s tales of the supernatural, on the themes of doubles and the resurfacing of the repressed. Evoking dead bodies, ghosts and revenants, the psychoanalyst used as equivalents (in some languages) the word “unheimliche” and the expression “a haunted house” 9. Almost a century later, the Gue(ho)st House seems to illustrate these statements of Freud: “the boundary between fantasy and reality is blurred”, “we are faced with the reality of something that we have until now considered imaginary 10”. This is not a dream image… Moreover, on the inside, there is a total change of atmosphere. With its large, bright room giving onto the garden, and its white floor extending outside, the space is transfigured. 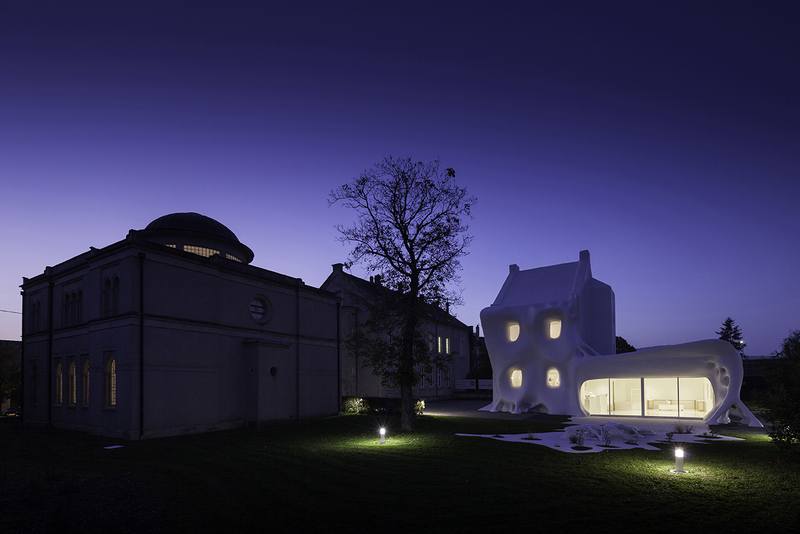 Total reversibility, as if the house could be turned inside-out like a glove. 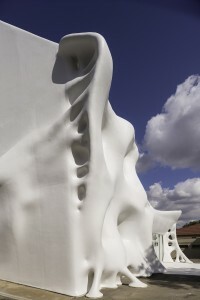 The landscape, too, is reconfigured by the strange organic shell that covers the building: the protuberances distort the right angles of the openings (a large picture window and smaller windows), the whiteness acting as a hyphen between the Synagogue’s exhibition space and its new reception area. 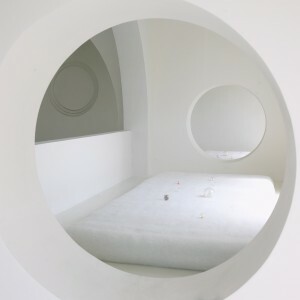 Interested in “interactions between the brain, body, environment and constructed space 12”, Berdaguer+Péjus created strange all-white Psychoarchitectures, created by means of stereolythography based on pictures of houses drawn by children as part of psychological testing. The Gue(ho)st House is just as troubling, bringing into question the boundaries between what is sound and what is not. It seems unreal and irresolute, like a mental image. With its high and low reliefs, the house encourages escape, it offers more than one blind spot for hiding. The garden and the house are potential living, learning and playing spaces for the residents of Delme, especially young visitors of the exhibitions. While it is everywhere a matter of an “architectural object”, the artists are pursuing another dream: a dream of invisibility, based on an exogenous architecture, whose form is suffused with a virus developing from the outside like a parasitic fungus. In 1924, Kiesler started conceiving an Endless Theatre, perhaps echoing Constantin Brancusi’s very paradoxical Endless Column… The work of Berdaguer+Péjus is a work of sculpture. Contradictory simultaneity, “revenance”, invisibility, non-finiteness, open work: this is the important data for these artists who “work on the limits of the visible, on the limits of language 15”.